1. Only a unmarried male candidates can apply for this NDA Online Form. 2. Candidates’ age must lie in between following dates: “before 2nd January, 2000 and not after than 1st July, 2003” for applying this UPSC Exam 2018. Educational Qualifications: All Indian candidates who are wishing to apply for this NDA application form must have completed their 12th class from a well recognized education board of India. What is the Application Fee to be paid for this NDA Exam? 2. While all other cat. Candidates need not to pay anything for applying this NDA Exam 2018. 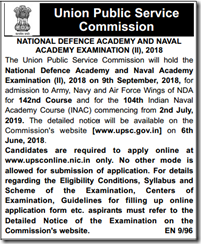 What is the Selection Process for this National Defence Academy Exam? How to Apply for this UPSC Exam 2018? Those who meet with all eligibility criteria related to this NDA Exam can apply online through the UPSC official website. There is no other way for filling up NDA Application form. 6th June 2018 is the Starting Date to apply online. 2nd July 2018 is the Last Date for NDA Application form. 9th Sept. 2018 is the NDA Exam date.